One thing about moving to the Southwest, there sure are some amazing and gnarly looking bugs out here. The desert is not brown and dead like I imagined it would be before moving here. It’s teeming with plants and animals, most of which I’d never seen before, and they’re so interesting-looking that I do a double-take every time I see a new critter. I’m like a 5th grader at the science museum. I’ve spent more time looking at the ground here than I have my entire life. Some of that is to avoid rattlesnakes on the trail, but a lot of it’s due to the sheer exoticness of creatures here. One of my favorites is the tarantula. Until we moved, I’d only ever seen these hairy beasts in zoos, but they’re a native species here. The first time I saw one au naturel I was running in a city park in Alpine, TX. I could see it moving along the sidewalk, very slowly, so I stopped to get a closer look. These guys are huge and beautiful. They’re so big that I’d never even think of squishing one under my shoe if it were in the house – it’d be like trying to stomp a squirrel. Anyway, I could see this tarantula was dying, and the longer I watched him, the sadder I felt. I found a stick and tried to move him under a tree, imagining that might be a comfort to him. The next day he was dead, but I saw his body there for weeks until some other creature dragged him away. Later that summer, I saw another tarantula up on the mountain trails behind my house, but he climbed away and down into the rocks before I got within five feet of him. I told my friend Barbara, a native Texan, and rancher, all about it. She wasn’t nearly as excited about this sighting as I was, although I could tell she liked them too. “Shoot, they’re all over out here.” she said, “Just wait until autumn when mating season starts. You’ll see tons of ’em crossing the road, boys looking for girls.” She then proceeded to tell me how to tell males from females. 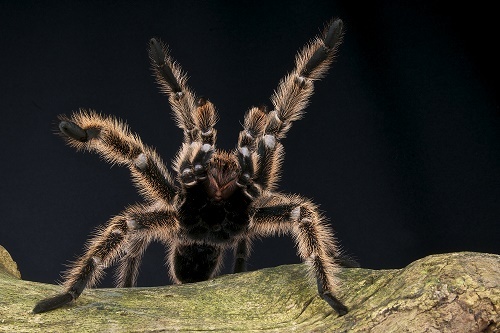 Tarantulas are magical – they can make you see nature in a whole different way. I’m so taken with them that I almost bought a house in southwest Texas largely because I saw two of them on the property. A house, 90 acres, beautiful mountain vistas, and fabulous tarantulas. What could be better? First I saw a brown male bigger than my hand moving through the flower bushes near the porch. He really was bigger than my hand. Proof of just how large a tarantula can be. As we were getting into the car, I saw another huge furry male rearing up on the garage roof. The tarantula on the garage roof was rearing up just like this. From where I stood, he looked as big as a football. I was afraid yet mesmerized. It made me want to buy the house all the more. Sadly, it wasn’t to be. We didn’t get to buy it after all due to too many red flags, but I wish we did. Every time I think of it, I see that huge spider waving at us from the garage as we left. We also didn’t get to stay in Texas either and found ourselves living in southern New Mexico where the terrain, while not identical, is similar. I was in mourning over leaving the house and western Texas. Then one day, to my delight, my plumber told me he’d just seen a bunch of tarantulas along the road below our house. “It’s mating season, so you’ll see plenty of them up in these mountains,” he said. Tarantula spotting fever hit me. I immediately hit the trails with my pack and my poles. For most of two hours, I walked slowly along, scouring the bushes for movement. No luck. I was just making the turn off the trail and toward the post office when one of my neighbors pulled up and rolled down her car window. I thought maybe she’d have some tarantula hunting tips for me. “Hey,” she said, “Just want to warn you, a woman was stalked by a mountain lion yesterday on West Hill Road about a mile away from here. When she tried to scare it, it didn’t back off. It kept coming. She’s okay but she was sure shook up. They have a 15-mile range. I know you’re on the trails alone a lot, so be careful.” I thanked her for the news and we parted. Mountain lion? Maybe I should be looking up more, and down less, while I’m hiking. The tarantulas can wait. 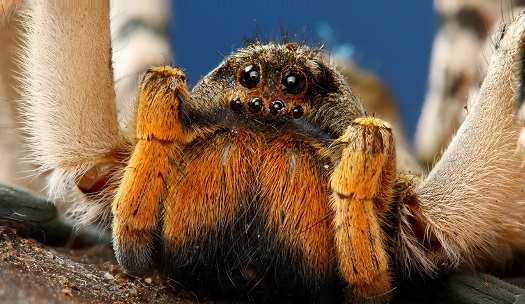 Regarding spiders only: Tarantulas are okay, but brown recluses not so much? No kidding – I am wayyy afraid of encountering those brown recluses! Thanks for reading!